Pucker up, my pretty! Valentines Day worksheets with lots of love coming your way. 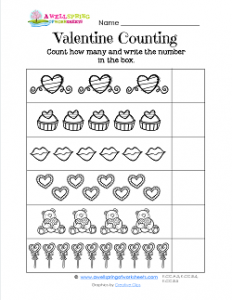 This counting worksheet has lots of reminders of love to warm your heart. Have your kids count the objects and write how many in the boxes at the end of each row. The objects to be counted include hearts with swirls, cupcakes with hearts on them, puckery lips, a lacy heart, a teddy bear holding a heart, and lollipop hearts. Have fun counting. Color, too, if time permits.